This whimsical Victorian Christmas ornament is an authentic reprint of a 1800's pattern provided by Godey’s magazine. The printed design for the Christmas ornament elephant was hand-colored and sprinkled with various colors of glitter. Embroidered ribbon and green beads were attached to the ornament with glue. Silk fringe and red tassels were also added. 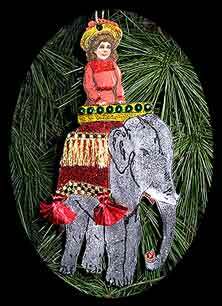 Finally a scrap or die cut of a Victorian girl was placed atop the elephant to complete the Christmas craft. Print this Christmas craft on white heavyweight card stock printer paper. You can print as many as you need for your Christmas crafts projects. A variety of trimmings can be used to embellish the Christmas ornament in the tradition of a truly Victorian Christmas—make it simple or very ornate. Use colorful glass beads, metallic ribbon, lace, gold and silver foil paper, fringe, feathers, tinsel, Victorian die cut or scrap of a child or adult to sit on top. You can find an endless variety of embellishments in the scrapbooking department of your local craft store. Glitter or sparkle glue in a variety of colors. Trimmings such as colorful jewels, glass beads, metallic ribbon, lace, gold and silver foil paper, fringe, feathers, tinsel, Victorian die cut or scrap of child or adult. You can find an endless variety of embellishments for this Christmas ornament in the scrapbooking department of your local craft store. Print the Christmas ornament design in Black on Card Stock or Heavyweight printer paper with the Print Quality setting on on Best. You may choose to color the Christmas ornament design before cutting out, but you must cut-out before adding trimmings. Color Christmas ornament design with color markers. 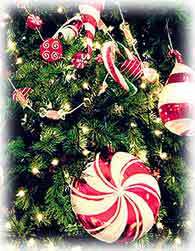 Decorate the Christmas ornament with glitter by first applying glue to area and then sprinkling with glitter. To apply more than one color glitter, allow first application to dry before applying another color. Or decorate with Glitter Glue. This is an easy product to use. With an easy to hold bottle, you can make a fine line or a thick area with an assortment of sparkling colors. Use your imagination! Add trimmings such as colorful jewels, glass beads, metallic ribbon, lace, gold and silver foil paper, tissue paper, fringe, feathers, tinsel, die cuts or scraps. You can find an endless variety of embellishments in the scrapbooking department of your local craft store. Add a Victorian scrap or die cuts of a Victorian child or adult to sit on top of the elephant. Add a bright ribbon loop to hang the ornament on tree. The finished ornament can also be backed with felt, glitter paper or paper lace doilies before hanging on tree. 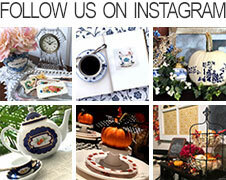 From: "Christmas Ornaments - Authentic Victorian Designs." Free download of this ebook of Victorian Christmas ornaments is available HERE.